With Photomerge Exposure in Photoshop Elements 11, you can take photos with two different exposure settings and let the command blend them together for the perfect shot. Occasionally, you need to capture a shot that presents an exposure challenge — your foreground and background require different exposure settings. This challenge often occurs in shots that are backlit. For example, you have a person in front of an indoor window in the day or someone in front of a lit nighttime cityscape or sunset. You can capture your shots using exposure bracketing (shooting at consecutive exposure camera settings) or with a flash and then without. Elements can detect all these camera settings. Use a tripod to keep your shots as aligned as possible. Good alignment helps the blending algorithm do a better job. 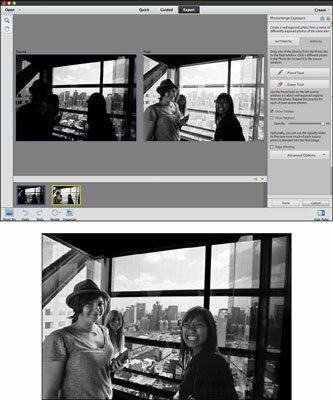 Choose Enhance→Photomerge→Photomerge Exposure in any of the Photo Editor modes. Simple Blending: Select the Simple Blending option, and Elements automatically blends the two images. Smart Blending: Select the Smart Blending option to access sliders to adjust the Highlights, Shadows, and Saturation settings for finer tuning of the resulting images. If you mess up things, click the Reset button. If you feel the need for even more control, click the Manual mode tab. In Manual mode, choose your first shot from the Photo Bin and drag it to the Final window. If your other image isn’t already the source image, drag it from the Photo Bin to the Source window. With the Pencil tool, draw over the well-exposed areas you want to retain in the source image. As you draw, your final image shows the incorporation of those drawn areas. If you mistakenly draw over something you didn’t want to keep, grab the Eraser tool and erase the Pencil tool marks. Choose to have your preview show strokes and/or regions. Gain further control of the blending by dragging the Transparency slider. Dragging to the right blends less of the source areas into the final image. Select the Edge blending option to get an even better blend of the two images. With the Alignment tool, click your source image and position the three target markers on three key locations. Do the same on the final image, choosing similar locations. Again, as with the other Photomerge commands, the more alike your starting source images are (similar framing, similar angle, and so on), the better the merged result. If you muck up things too badly, click the Reset button and then start at the appropriate step, depending on your mode. If you’re in Automatic mode, start again from Step 3. If you’re in Manual mode, start again from Step 5. The file opens as a new, layered image in Elements. The blended image appears on Layer 1. The background is your starting final image. You can then flatten the layered file, which retains the appearance of Layer 1. Or you can double-click your background to convert it to a layer and then delete it by dragging it to the Trash icon in the Layers panel.